I did not. Moisture getting inside has been minimal. I have had one dog dig into the wood over time and I eventually resurfaced the floor of the first one I bought. Which was simple to do. I like the interior materials of the Dog Den better but the design of this product is far better to keep the dog draft free. At this time I only have a seasonal use outdoor kennel. Meaning in the winter I do not use the outdoor kennels. I have not seen a plethora of dog kennel set ups, but I have worked as a zoo keeper for the last 23 years. Whether you're cleaning elephant crap or dog crap, there are a few things of similarity to consider. I prefer to keep an extremely clean space for my animals. I opted for concrete flooring. I like the ability to keep it clean and disinfected. It has a broom finish for traction. I'm not concerned about poop sticking in broom finish as I pressure wash the kennels at least once a day. Sometimes more. I currently just have Dog Den 2 dog houses, but I do plan to up grade the whole set up. The runs are currently 4'x10', which I believe are too small. My next ones will be 5'x10' minimum. Currently water just runs off into gravel in front of the kennels, then seeping into the yard. In the future I will do a better job at planning water drainage. I'd prefer some sort of drain and septic tank. My future puppy runs will likely be sand with the fencing sitting on a concrete curb. I will spend the extra cash to heat the concrete. I will likely do this in a couple of zones, such as an indoor zone and outdoor zone. Lots of really great ideas. AG, it appears that you used part of your shop for the indoor dog space. Could you give me an idea of how you did the drain in that area? Did you wall off a small portion of your shop to designate it for this and simply have the cement slightly sloped in that area of your shop, only, for water to go into a drain? 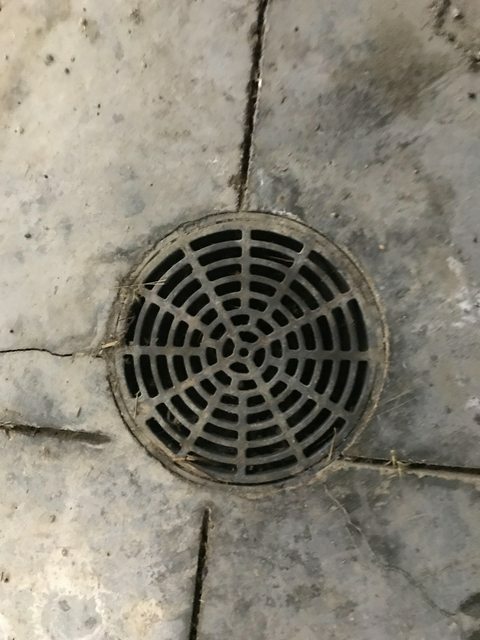 Picture of drain? I may end up forgoing my original design that included an extra indoor lean to space for indoor dog compartments and include this as a space inside my shop itself due to the price of some of my quotes I received today. Steel and concrete have both increased considerably since my neighbors built their shops. I may end up forgoing indoor/outdoor altogether and do something similar to KJ’s current set up, which is still nice and better than what I have. Just trying to figure out if using some of my shop space is best. The problem is I want to have the option of only heating and cooling a smaller area (not the entire shop) to save money over time. I could still do so I suppose if I walled off a section and put an AC Unit on it. Yes I have standard floor drains with slope running to them. They drain through 3 inch pipe to daylight into my timber about 30 yards from the building. Sure could be better designs as the relief cuts in the concrete are prone to collecting stuff. My adult male dogs always go to the bathroom in the outside portion of the kennel runs (1&2) and will hold their stools for 12 hours if my routine is consistent. Puppies would be different of course. I lived in the shop while building my house and so have a propane wall furnace and a window air conditioner. With the insulation in the walls and ceiling I never run them for the sake of the dogs now that I am in the house. It was 6 below zero F yesterday morning and the shop was 45 degrees with no heat source running, have never seen it above low 80s in the summer, but the dogs lay in the shaded outdoor run with ceiling fan above them vs indoors. I zip tie some shade screen to the south side of the outdoor kennels in the summer to keep the low rising morning sun off and they are otherwise in the shade with air moving. That helps. I was wondering how often I’d need to run the air and heat. You dont live too far a North of me , so our weather probably differs only a little. I was concerned about having to run air constantly in 90 plus weather. The drain pic helps too. Did you wall off a separate space, and insulate it, where the inside dog compartment is? Such as a 10 x 20 ft space, for example? I’m considering either just putting doggy doors in the side wall of the shop with no additional walls and wide open (with about 5 x 5 ft indoor kennels for each) or walling off 10 x whatever (inside the shop itself) and having a separate door for that space to enter from inside the shop. The former (no extra walls) would allow for better use of the shop space. The latter would allow me to heat and cool a small space if I wanted. A walled off space designated for indoor runs, however, may be unnecessary though based on what your (AG) saying about temps inside without running any ac/heat. Ok, I’d like suggestions for quality dog kennels that will be durable and last. I’ve decided on 5 x 10 ft by 6 ft tall. Welded wire is my current preference, but I’m open to chain link. I've looked at Mason for chain link and they seem high quality. TK looks good for welded wire, but I saw some things about customer service that have me questioning going with them. Priefert has poor reviews concerning rusting out. I'm open to suggestions on brands. JTracyII wrote: I've looked at Mason for chain link and they seem high quality. TK looks good for welded wire, but I saw some things about customer service that have me questioning going with them. Priefert has poor reviews concerning rusting out. I'm open to suggestions on brands. My suggestion would be to call a couple of large kennels and inquire what brand of panels they have had that offer the best service life. Mine were made by a fence company and have held up for 20yrs. A little rust here and there especially on the runs where I've had the males but the fence fabric has held up well. What I like about the chain link is I can repair about any part of the panel with material bought locally and not require any welding. Thanks for the suggestion. I actually called them at 9 AM when they opened this morning. Jeff W. told me about them. He knows Ronnie Smith and he said that Ronnie was having all of his many kennels replaced by Kennel Connectors. If they are good enough for him I figure they will do for me. As a very well known trainer he houses countless dogs throughout the year. I was impressed by what I heard when talking to Kennel Connectors this morning. A little more expensive than what I prefer to spend, but I am starting to think they will outlast almost any welded wire kennel, which in the long run will be a cost savings. The only problem is they don't have a top that can be purchased yet, which I may want. He said that they are working on designing a top that will work. Don't know if I need one though. I know I can put a cow panel across the top, but I'm not sure if that is my preference aesthetically. Like my dogs though, functionality and durability are more important to me in the long run than looks (which is why I have ugly dogs ), so I may go with them. JTracyII wrote: ..... I know I can put a cow panel across the top, but I'm not sure if that is my preference aesthetically. A panel with 2x4 openings is what I used across the top of mine. It only covers the area above the dog houses. I bought one that runs the entire width of the kennels and added top rail across the middle to attach the inside edge of the panel. You can't tell if it is even there until you are near the kennels. Can be cut to fit with a 4 1/2 angle grinder and a cut off wheel. I'll take a picture later. JT3, Sounds like you are on it. I too have a heavy gauge chain link kennel which has held up as new for approx 25 years now. It is the one in the photo I posted. The bottom rail on the middle panel rusted through from Male dogs on both sides marking it for a couple of decades. I removed it, took it to weld shop and had a new rail welded in - should be good for another couple of decades now. The chain link fabric will apparently never give up as it shows no sign of it so far. Will out last any welded panel kennel I have seen by a long shot. Will you have a roof over the kennel? I recommend one to save you from shoveling snow, keep rain off your dogs, provide shade in the heat, gives place to mount a ceiling fan if you want one. As far a cover over the kennel I had a functional but crude one over my kennel prior to moving. I ran a couple of 2x4s across the top and put welded wire (2x4 openings) mesh over the top, wired to the top rails all around. And I put shade screen material over the top of that which held up for a couple of decades as well. The downside to it was with no slope on it so I had to shovel snow off the top using a step ladder and reaching in from the sides. Not something I want to do again. Which is why I put a peaked roof over the top of my current kennel and would always do that again. My dog houses are set inside the machine shed which prevents a dog from being able to stand on top of them making it a much shorter jump to go over the top. So I have not put a top on this kennel, but obviously would if I ever have a climber. This is how I attached the panels to the top of the kennel. I use the shade cloth and have experienced the same issue as Kent with the snow. Have considered a more permanent solution. The kennels will be covered from the top as they will be placed on a gently sloping concrete pad under a lean to coming off of the main metal building. The lean to will extend 2-4 feet beyond the edge of the kennels (depending on how long I make the kennels) and have the same slope as the building. The lean to will be several feet above the top of the kennels hence the concern for dogs jumping out. Maybe it won’t be a major issue. If so, I can address it quickly with one of your ideas I suppose.